HOT TIP: Due to high demand and a low “guide to guest” ratio, many of Kualoa’s tours sell out weeks in advance. We highly recommend booking your tour before you arrive in Hawai’i for the best tour times. 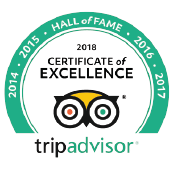 Proud to be in TripAdvisor’s Hall of Fame for being the best of Hawaii tours & activities for the last 5 years in a row (2013-2018), Kualoa offers O’ahu’s top tours and activities. Kualoa is also rated Number one by Hawai’i Magazine and the StarAdvertiser’s Readers Choice Awards for 2017 and 2018. In 2018, Kualoa was ranked number 4 on Trip Advisorʻs list of “Top Trending Worldwide Attractions”. If your desired date or time is sold out online and you really want to try a specific tour, you can search for availability for one (1) as many times there will be single tour spots available at the last minute. Kualoa prides itself on offering the best possible guest experience, so on many tours there will be less than ten (10) guests for each tour guide such as on Zipline, Raptors, ATV’s, Horseback and eBike tours. On the Jungle Expedition there are sixteen (16) guests per tour guide and on the Movie Site Tour there are forty (40) guests per tour guide. You may purchase individual tours or for the best value, an All-Inclusive Tour Package includes a FREE Ranch House “All You Can Eat” Buffet Lunch (valued at $17.95 per person). Kualoa is open 7 days a week (except on Christmas & New Year’s day) from 8:30 am until 5:30 pm. Roundtrip Transportation from Waikiki Hotels to Kualoa is offered for only $15.00 roundtrip (or $10.00 roundtrip with a combination package booking). If you’re visiting the island of O’ahu, be sure to come and experience the best Oahu Adventure tours at Kualoa Ranch & Private Nature Reserve! Reservations are highly recommended to be made at least 48-72 hours in advance as most tours will sell out daily. Book online or call our reservations center at 808-237-7321. For Active and Retired Military and Kama’aina rates, please call reservations to inquire. If you should choose to purchase our transportation option, please note that we provide two options, a morning pickup between 6:50AM and 7:15AM at designated Waikiki hotels, and an afternoon option that leaves picks up guests in Waikiki starting at 10:30AM. Return shuttle options from Kualoa back to Waikiki hotels depart at 1:00PM, 2:30PM, 2:45PM, 3:00PM and 3:45PM and 6:00pm.